Few scholarly studies of local resistance to Prohibition exist. This book deals with New York City as the nation’s greatest liquor market at the start of Prohibition. Supporters of the Eighteenth Amendment looked forward to “drying up” New York City as their greatest triumph. Instead, the city remained the nation’s greatest liquor market with the help of smugglers, bootleggers, and scofflaws. Next the book examines the emergence of three major smuggling syndicates in Manhattan: on the Lower East Side; West Side; and in Little Italy. These syndicates eventually merged into the Broadway Mob based in midtown Manhattan. Further, the book studies New York City’s scofflaw population — natives and tourists who “scoffed at the law” in an estimated 30,000 speakeasies and 500 nightclubs. The city produced anti-Prohibition politicians with national reputations. These included Congressman Fiorello La Guardia, Mayor James “Jimmy” Walker, Columbia University’s President Nicholas Murray Butler, socialite Pauline Morton Sabin, and Governor Al Smith. New York City’s smugglers, bootleggers, and scofflaws resisted the 18th Amendment and actively asserted the right to drink alcohol for enjoyment. This puts them squarely in the American tradition of fighters for liberty. Their persistence was key to the unprecedented repeal of a constitutional amendment ending Prohibition. Published by State University of New York Press, 2013, 160 pages, $19.95, ISBN 978-1-4384-4816-9 paperback and as an ebook. To order, call toll free at 1-877-204-6073 or e-mail suny@warehouse.com. This is a scholarly book with extensive footnotes, bibliography, primary documents,and index as well as narrative and photographs. The book was designed for use at the college level as supplementary reading. If you are an instructor, you may order an examination copy to decide if you want to adopt it. There is a $10 processing fee. To order an examination copy, go to www.sunypress.edu/l-50-exam-desk-copies.aspx or click here. Smugglers, Bootleggers, and Scofflaws: Prohibition and New York City is now available on kindle or paperback at both Amazon and Barnes & Noble! In popular culture, Prohibition apears to have been more of an experiment, or a quirk, than a subject for close scholarly inspection. 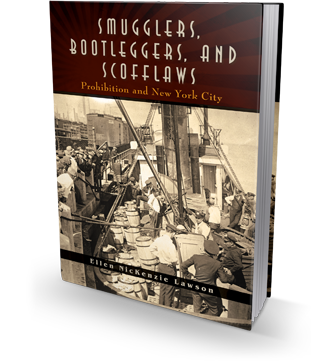 But in her new book Smugglers, Bootleggers, and Scofflaws, Ellen NicKenzie Lawson mines a fantastic trove of little-used sources to detail the experience of Prohibition for three distinct but related groups of then-criminals in New York City. Over the course of her book, Lawson builds a credible, detailed argument for the serious study of resistance to Prohibition. l. Letter to Asst. U.S. Attorney from relative of sailor lost on smuggling ship. 2. Anonymous letter to Dept. of Justice on corruption in community on Long Island. 3. Letter to U.S. Treasury on smuggling to eastern end of Long Island. 4. Anonymous letter To U.S. Treasury with tip on smuggling in northern New Jersey. 5. Anonymous letter on smuggling to Fulton Fish Market in East River. 6. Coast Guard telegram on smuggling to Fish Market. 7. Coast Guard Division Commander’s letter on Fulton Fish Market. 8. Statement of crewman aboard smuggler to Long Island. 9. Seized letter of bootlegger in Havana to friend in New York City. 10. Letter of father in Sicily to captain of smuggling ship to Long Island. 11. Selected Congressional testimony by U.S. Attorney for Southern District of New York.